The Spurs tied an NBA record with the most consecutive wins by 12 points or more as the topped the Rockets with a second-half onslaught. The 2008-09 Cavaliers did it, then lost in the eastern conference finals to Dwight Howard’s Magic. The 2011-12 Heat did it, then won the NBA championship. Six of the nine teams in the playoff mix were on the floor on Wednesday night. Only one of the games though remained close in the fourth quarter. The Mavericks got a huge night from Tyson Chandler, who had 23 rebounds, and a big shot from Dirk Nowitzki late to push back the Suns. The win clinches the 7th seed for the Mavericks, while the loss eliminated the Suns from the playoff chase. The game of the night was expected to be in San Antonio, where the blazing hot Spurs hosted the Rockets. It was pretty good for the first 24 minutes, but right at the end of the second quarter, there was a glimpse of what was to come. Trevor Ariza hit a 3-pointer with 5:38 remaining in the first half to give the Rockets an eight-point lead. The Spurs called timeout. The Spurs took just two minutes to tie the game with an 8-0 run, then finished the half with a four-point lead. They opened the third quarter and added to that 16-4 run and essentially ended the game. Less than 10 minutes later, they had a 15-point cushion as the Rockets managed to hit just three of their first 12 shots of the second half. The lead for the Spurs did not dip below 12 the rest of the game. The good news for Houston is Dwight Howard continues to have a huge impact on the game, albeit in limited minutes. He had 16 points and 11 rebounds in his 22 minutes of work and has pushed his per 36 minute averages to 24.2 points and 14.4 rebounds in his six games since his return. He’s also shooting 66 percent from the field. The bad news is they no longer control their destiny for the division crown and the number two seed. More explanation below. The Grizzlies were in control of their game from start to finish against the Pelicans. New Orleans shot just 35 percent and Anthony Davis was held in check, with just 12 points and five rebounds. The Pelicans still control their own destiny, but their remaining schedule, as mentioned several times the last several weeks, is brutal. While the Thunder’s is much more manageable, see below. LaMarcus Aldridge returned for the Blazers and they blew out the Timberwolves. The Blazers still have a very remote chance of moving up to the three or two seed, but are almost locked in at number four. In what cold be a second round playoff preview, although nobody is predicting that, neither team really had anything to play for. The Warriors have home court advantage throughout the playoffs, while the Blazers are almost locked in to the number four seed, with only a small chance of finishing the season with a better record than the the five seed. They must finish with a better record than the five seed or they will not have homecourt advantage in the first round. Here’s the look at the west standings and the remaining schedule. Click the graphic to enlarge. With just one week of games left, it’s time for a brief discussion on finishing scenarios. Friday night will be a huge night to help crystallize what each team needs to do to claim the best possible seed. On Wednesday night, the Grizzlies earned the tiebreaker over Houston since the Rockets can no longer have a better division record than Memphis and the Grizzlies will have a better conference record if the two teams are tied at the end of the season. If the Spurs beat Houston on Friday, then San Antonio will also have the tiebreaker over Houston. The Clippers also have the tiebreaker over Houston based on better conference record, although if the Rockets win the Southwest division, that tiebreaker would be in favor of Houston as division winners win tiebreaker from team not winning a division. If the Rockets win out, they will need one loss from Memphis to give Houston the southwest division title and the number two seed. As seen in the chart above, Memphis plays their next three games on the road and they are just 2-4 in their last six road games, including losses to Detroit, Washington and Boston. NBA Vine of the Night – I wouldn’t normally dip into such a meaningless, uninteresting game, but here is a recent D-league call-up putting a first round draft pick on his keester. But it only is fun since the fallen player took to twitter to acknowledge the play. The NBA can be fun. Here was Gary Harris’ acknowledgement on twitter. Check back daily for the latest updates. Dwight Howard has not played in a game for the Rockets since January 23, when he played just under nine minutes against Phoenix. He’s had a bone marrow aspirate procedure in early February and was expected to be re-evaluated four weeks after that date. Things have progressed positively as his rehab work has now included on-court basketball activities. 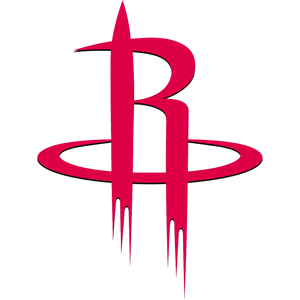 Houston has been forced to play without power forward Terrence Jones for the last two games because of pneumothorax (partially collapsed lung) and no definitive time table has been given for his return. Following the Rockets 110-100 win over the Pacers, Rockets head coach Kevin McHale made it sound like the Rockets next game is at New Orleans on Wednesday and it could be Howard’s next game too. Howard has missed 38 games this season and while Houston has gone a remarkable 25-13 in those games, Houston has been getting out-rebounded regularly, including by a 40-35 margin by the Pacers on Monday night. Houston is 22-10 in the 32 games that Howard has played. He’s averaging 16.3 points and 11.0 rebounds per game this season. Josh Smith, has been spending much of his time playing center in Howard’s absence, but he, too, is among the walking wounded, playing through a right ankle sprain against the Pacers. Smith had 18 points on 4-of-6 3-pointers and five rebounds in just under 29 minutes off the bench in the win. Houston has 12 games remaining, including six of their next eight on the road. Houston is behind Golden State and Portland. Howard is again listed as questionable for Wednesday night’s rematch against the Warriors who are a league-best 17-2 and are riding a 12-game winning streak into their game Monday night against the woeful Timberwolves. Click for full rankings. Spears adds a positive note on Howard, though it was not echoed by anyone following Rockets Monday practice. Seeing them in the five spot might be a bit low, they have wins against two of the teams ahead of them, San Antonio and Memphis. But they have also lost two games to teams ahead of them, Golden State and Memphis. Click for full rankings. Up four spots from number seven a week ago. The Harden note should be 25, 6 and 6 as Harden is one of just two players even averaging six points and six rebounds a night. The other is Boston’s Rajon Rondo, who is averaging less than nine points per game. Click for full rankings. 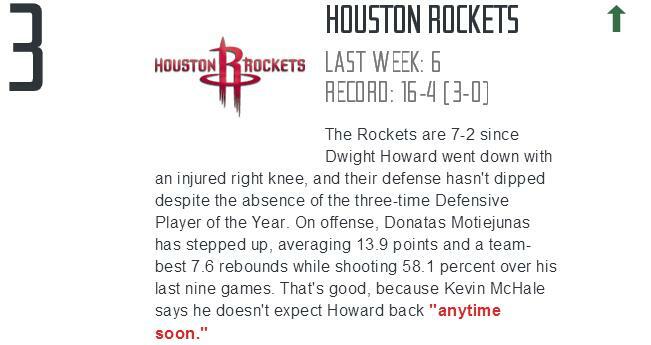 One more instance of media picking up on only one of the things that McHale said about Dwight Howard. Before the Rockets Saturday win over Phoenix, McHale said he didn’t expect McHale back anytime soon. Then during his post-game press conference, just several hours later that same day, McHale said, “hopefully we’ll get back Dwight back and Isaiah (Canaan) back, hopefully, relatively soon.” So which is it? Most nationally media outlets picked up the comment from before the game and completely ignored the one after the game. Click for full rankings. The only non-top five ranking comes here. It appears to be due to the belief from Schuhmann that injuries are eventually going to slow Houston down. Also, note their recent winning streak actually moved them UP to seven from eight a week ago. If their defensive rating stays top five all season, then the Rockets will be ecstatic. Should note that the Mavericks are one spot ahead of the Rockets after a week that had the Mavs losing badly at home to Phoenix (who the Rockets beat easily the next night) and a pair of wins against eastern conference teams that required buzzer-beaters. Click for full rankings. Yet another site clinging to one McHale quote, but not the other. Also, a hat tip for Donatas Motiejunas, who is averaging 14 points, 7.8 rebounds and shooting 58 percent in his last five games. He also has not picked up more than three fouls in any of the five games, while averaging over 31 minutes per game. Click for full rankings. Sat down with Bleacher Report for a “Finish the sentence” video on the Houston Rockets. The third ‘sentence’ hits on something that’s become very popular narrative the last couple of days – players don’t like Dwight Howard. While it may have taken awhile for the Rockets to get going, once they did, they made easy work of the youthful Timberwolves, 113-101 before an enthusiastic Mexico City crowd. Houston remained undefeated in Mexico City, now 2-0, after turning a scant four-point halftime lead into a 21-point second half-advantage to equal Toronto and Memphis at 7-1 with the league’s best record. Dwight Howard returned from a one-game absence with flu-like symptoms, to dominate the paint with 22 points, 10 rebounds and four blocked shots, not to mention countless altered shots at the rim. Even better, he and James Harden combined for just a single turnover. Houston came into the game, second in the NBA for most turnovers per game at just over 19 per contest. They had just 13 in the game, that, along with their strong work around the rim defensively, made it rather easy to eventually pull away from the Wolves. It was another night where Harden could not find the range on his shot, missing 15 of 23 attempts. He shot just 35 percent, already the fourth time in eight games, he’s shot worse than 36 percent in a game. He did that just 13 times all last season. But it was also a night where he picked up 10 assists. It was already his third 10 assist game of the season, something he did only 12 times last season. Each double-figure assist game has come away from Houston and each has come in a Rockets victory. Only John Wall, Chris Paul and Rajon Rondo have more 10-plus assist games this season. Harden’s 7.5 assists per game place him 6th in the league. The Rockets played their sixth game with at least one starter missing, but got a big lift from a pair of rookie reserves. Terrence Jones missed his fourth game with a leg contusion and Pat Beverley was out for a fifth time with his hamstring injury.Kostas Papanikolaou and Tarik Black provided a jolt of offense, combining to make nine of their 14 shots for 24 points off the bench. Papanikolaou found his 3-point shooting stroke, making all four of his 3-point attempts, despite coming into the game as just a 28 percent (8-of-29) 3-point marksman on the season. He also had four assists in a game, three of which came on consecutive possessions in the first half that resulted a three point play for Howard, a 3-pointer in the corner for Harden and then a dunk for Harden. Black did was he has done since arriving in Houston, throwing everything he has into rebounding and finishing at the rim. He was 5-6 for 10 points and grabbed six rebounds. It wasn’t just the rookies that kept things rolling offensively in the Rockets highest scoring game of the season. Jason Terry, continues to show that he still has more to give. He launched three 3-pointers and made them all and is now shooting 55 percent (18-of-33) on the season. Houston scored the first five points of the second half, then minutes later put together a 19-6 run to extend their lead to 87-70, before coasting to the victory. Up next: Houston (7-1) hosts Philadelphia (0-7) on Friday night at Toyota Center. The Sixers are the last remaining winless team in the NBA, and this is the second and final meeting of the season between the teams. The Rockets beat the Sixers, 104-93 earlier this season in Philadelphia. No matter how things played out on Tuesday in Miami, it was a pretty safe bet that if the Rockets emerged from the game still undefeated, it would be their most impressive performance of the season. They beat the previously unbeaten Heat, 108-91, and without a doubt it was the Rockets best work of the season. James Harden was once again spectacular, turning in a near triple-double performance with 25 points, nine assists and 10 rebounds. Four of those rebounds and three of those 10 dimes came during the final six minutes of the fourth quarter as the Rockets closed out their fifth consecutive double-figure victory to open up the 2014-15 season. Dwight Howard added his fourth double-double of the season with game-highs of 26 points and 10 rebounds. He put the Rockets on his back in the fourth quarter with 12 points on 5-of-6 shooting. Once again the Rockets long-range shooting continues to be blindingly good. They made 17 more 3-pointers on 37 attempts, connecting at a 45.9 percent clip. Trevor Ariza continued his blazing start making 5-of-8 attempts, scoring 19 points. He’s now 21-35 (55 percent) on the season on 3-pointers. Houston has made at least 12 3-pointers in each of their five games and the 71 3-pointers overall is the most in NBA history in the first five games of a season. After a tight first half that has neither team take a lead of more than seven points, the Rockets took just a two point 57-55 lead to the second half. Miami tied the game briefly at 59, before Houston went on an 18-5 run to push their advantage to 13 points. Twice in the fourth quarter the Heat closed to within three of four points. In both cases the Rockets had answers for their charge. After the Heat closed to 83-80 early in the fourth quarter, Houston went on a 7-0 run holding the Heat scoreless for nearly four minutes. When the Heat again cut the lead down to 90-86 at the seven minute mark, the Rockets called timeout and then put an end to the contest. Houston scored 13 points over the next 3:56. The Heat scored none. Trevor Ariza buried three of his five 3-pointers during that stretch that put the game away. Houston played without Terrence Jones, who missed the game with a leg injury, and also without Tarik Black, who missed his second straight game with a thigh bruise. Houston (5-0) hosts San Antonio (1-1) on Thursday night. When the schedule was released it was pretty apparent the Rockets were dealt a big break. All that remained was the Texans going all in and taking the whole pot. Four teams that were not playoff teams last season and were not expected to make any serious improvement this season would elcome the Rockets to the 2014-15 season. Three games in, the Rockets have hardly been tested on their way to a 3-o start. Their average margin of victory over the Lakers (0-4), Jazz (1-2) and Celtics (1-1) is 14 points and James Harden has been able to sit out the entire fourth quarter of two of their lopsided wins because, well, the games were so lopsided. The soft patch of the schedule continues for one more game with Monday’s game against Philadelphia (0-3), before they finish their second back-to-back of the season against the Heat on Tuesday night. The Rockets 3-point shooting has been excellent thus far and while the competition, or lack thereof, should be noted, the Rockets must be given some credit for taking and making shots. As a team, the Rockets are shooting 42 percent on 3-pointers, having made 38-of-90 shots, including at least 12 makes in each game. They rank second in the league in 3-point accuracy, trailing only the Hawks (48 percent). Houston finished 15th last season at 36 percent. Houston made two significant additions to the team in hopes that they could help raise the team’s shooting from long-range and so far, so good. Trevor Ariza, acquired in a sign-and-trade deal with the Wizards, leads the Rockets across the board with 18 attempts and 10 makes, connecting at a 56 percent clip. Jason Terry, who was added just before training camp, in a trade with Sacramento, has come off the bench to make 6-of-11 3-pointers. A third addition to the team, 24-year old rookie Kostas Papanikolaou, has rebounded tremendously from the preseason with his 3-point shooting. In the preseason, Papanikolaou launched 32 3-pointers, but made only seven of them for a lousy 22 percent. Through his first three NBA games, he’s made an impressive 5-of-11 3-pointers and along with Ariza, is helping the Rockets capably replace Chandler Parsons, who departed for Dallas in the offseason. Additionally, the Rockets opponents are unmercifully bad from long range. After the Lakers (3-10) and the Jazz (3-18) made a woeful 21 percent of their 3-pointers in the first two Rockets victories, the Celtics nearly posted an all-timer. Boston missed their first 22 3-point attempts, before Jeff Green finally knocked one down. Boston finished 1-of-25 for an insane four percent. Through three games, Rockets opponents are 7-of-53 (13 percent). That’s three fewer makes than Trevor Ariza has by himself. When the Rockets depart for Philadelphia, they’ll have four of their 15 players dealing with some sort of injury. Both Dwight Howard and his backup Tarik Black, both suffered leg injuries in the win against Boston on Saturday night. Howard said after the game he banged knees in the first quarter and it was really sore. This time it was his right knee, he had hurt his left knee similarly, knocking knees with a teammate in practice during the preseason. Howard remained in the game and played through it, although when he checked out of the game with 5:47 remaining, just three seconds after throwing down a slam for his 13th and 14th points of the game, he went straight to the locker room to get it looked at and began to get treatment. He said he hoped to play against Philadelphia on Monday, but would know more Sunday and of course Monday before the game. Black, a rookie from Kansas, took a shot to his left quadriceps during the second quarter, and while he tried to keep it loose after halftime by riding the bicycle while he was out of the game, he did not return. After the game, he said he didn’t think it was that bad, and figured he’d be ready to go on Monday. Guard Pat Beverley missed the Celtics game with his hamstring injury suffered against Utah and is listed as day-to-day. He has had a history of quick, nearly miraculous recoveries from injury, but unfortunately he’s had an incredible amount of practice with recovery in the last two seasons, having worked through a torn muscle in his mid-section, a fractured right hand, an abdominal strain, a right knee sprain (meniscus tear), dehydration in the playoff series that included a visit to the hospital and now this strained hamstring. Rookie center Clint Capela has been inactive all three games so far this season as he continues to work through a groin injury, although he has been able to do some work in practice recently. UPDATE: Starting point guard Pat Beverley is considered day-to-day with a strained left hamstring. He was injured during the fourth quarter of the 104-93 win over Utah on Wednesday. His availability for Saturday’s home opener against Boston has yet to be determined. He told the Jenny Dial Creech, Mark Berman and other local media at Friday’s practice he felt good, but wasn’t sure about playing on Saturday. James Harden deserves a ton of credit for the high accuracy rate because he’s been dishing the ball out exceptionally well. All 10 of his assists in the win over Utah were on 3-pointers for his teammates. On the season, Harden has assisted on 12 of the Rockets 26 3-pointers made this season and he’s made four of the others. While facing two of the league’s worst team’s in the Lakers and Jazz clearly is a factor and the team’s percentage is sure to drop, if they keep getting the shots they have been getting, it might not drop much. While rookies Clint Capela and Nick Johnson sit on the sidelines, two other rookies are important parts of the second unit. I wouldn’t expect Papanikolaou to start banging home four 3-pointers in a game with regularity, but the more he’s played, the better he’s been able to find the range on his long-range shots. What has remained fairly constant is his that he knows what he is doing. He looks like he will be able to provide the Rockets some of what they lost with Chandler Parsons and Jeremy Lin when it comes to play-making. He had four assists in each of the first two games and is making solid entry passes into the post, which is hugely important for Dwight Howard to take advantage of teams that do not bring double-teams to defend him. Tarik Black is the back-up center and he has been needed a lot already since Howard can’t seem to stay out of foul trouble. While he effort and energy has remained consistent with what he offered in the preseason, his positive effect on the games has waned. He’s no longer playing against players like himself hoping to make a roster, thus even against two bad teams in the Lakers and Jazz, the opposing front court players have been a bit too much for him. In 40 minutes, Black made just 2-of-7 shots and has grabbed only four rebounds. Black, though listed at 6-11, is well short of that and is going to have to learn quickly how to overcome the height disadvantage. It wouldn’t hurt if Howard stopped committing avoidable fouls. Here’s the accompanying podcast as they prepare for the home opener against the Celtics.